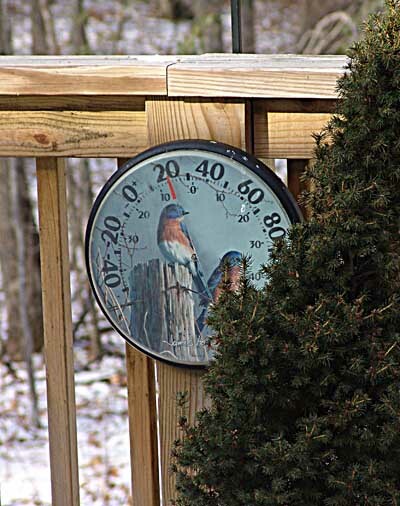 We woke this morning to see snow on the ground and the thermometer on the deck reading 20 degrees. The birds were scarfing up seeds and suet from the feeders as fast as they could go. It was a day to make up for lost time and lack of cold weather preparation. I drove into town to put studded snow tires on the van and also bought chains for our little tractor which we use to haul firewood around. I even managed to pick up enough pellets to keep the pellet stove running for the next few weeks, in case we get snowed in. In our part of Floyd, packed snow made the roads treacherous but this was the only area that seemed to have any snow at all. Low temperatures and biting wind could be found everywhere in the New River Valley. The streets of Christiansburg were as empty and as bitter cold as in downtown Floyd. A few havens of warmth provided respite from the winter chill. We spent lunch eating Scott Hutchinson’s marvelous crab bisque soup at Margie Redditt’s Over The Moon Cafe and Gallery. Later, I stopped in at the Coffee Depot in Christiansburg for a hot mocha to keep me warm on the way home. They have good coffee and a welcoming atmosphere. I would have lingered, but I was running out of daylight and had a lot more to do. It’s now 19 degrees and the wind continues strong from the northwest. A light dusting of snow has begun to fall. It should be an interesting day tomorrow. This entry was posted in Country Living and tagged Coffee Depot, Floyd Virginia, Margie Redditt, Margie Ryan, Mocha, Over the Moon Cafe, Scott Hutchinson, winter. Bookmark the permalink.